'Tis the season for science during Winter Wonder Days! August will be out of this world at Great Lakes Science Center, celebrate the solar eclipse and going back-to-school with us! Calling all mad scientists! Spooktacular Science returns October 27-28! Celebrate Independence Day with us! Celebrate mom with half price admission for Mother's Day weekend! Celebrate the diversity of America's music in new film "America's Musical Journey"
Discover the "science of sticky" when TapeScape-Sticky Science opens May 4! Engineer a winning strategy for Design & Build, our annual competition fundraiser! Explore the "Great Barrier Reef" with us when the film opens Nov. 3 in the DOME Theater! Get "eggcited" for Eggsperiment, March 30-31! Get ready to get grossed out when 'Grossology' opens October 12! Great Lakes Science Center box office to accept bitcoin beginning November 13! Great Lakes Science Center has summer fun down to a science! Join Great Lakes Science Center for a spring ‘Eggsperiment’! Join us for a Stay Curious Weekend September 23 & 24! Join us on March 17 and 18 for a Stay Curious Weekend and discounted admission! Receive half price admission for all moms on Mother's Day weekend! Science is on the menu for Turkey Tech weekend! Take Two! Double Features at DOME continue with holiday classics! Two adventures, one great deal! We are extending hours for "Super Saturday" on December 22! We press play on a brand new event, Ready Player Fun! We're celebrating Presidents Day weekend with Curiosity Carnival! We're offering half price admission for all dads on Father's Day weekend! Wear your "jammies" to Great Lakes Science Center for a special screening of "The Polar Express!" CLEVELAND (December 16, 2016) – By the hoary hosts of Hoggoth! 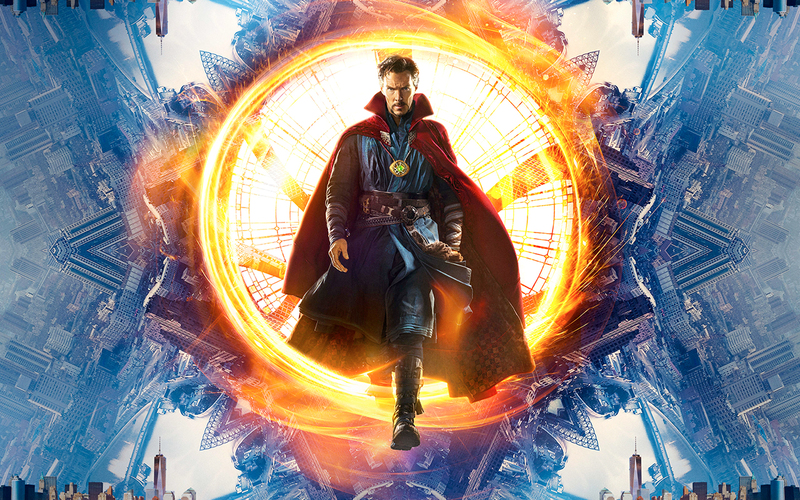 The Marvel cinematic universe’s latest blockbuster, “Doctor Strange,” is ready to open Thursday, December 29 in the Cleveland Clinic DOME Theater at Great Lakes Science Center! Benedict Cumberbatch stars as Dr. Stephen Strange, a brilliant and gifted surgeon with an ego to match. When a horrible car accident renders him unable to keep his hands steady enough to return to the operating room, Strange embarks on a journey to find an alternative method to heal his body, and his pride. What he finds ultimately is a new calling, an opportunity to use his brilliance in the service of mankind as a master of the mystic arts, protecting the Earth from threats even The Avengers can’t fathom! Opening night for “Doctor Strange” is 6 p.m. Thursday, December 29. The movie will show again at 6 p.m. on Friday, December 30, and Saturday, December 31 and continue on January 5, 6, 7, 12, 14, 19, 20 and 21. The recent digital conversion and interior remodeling of the former OMNIMAX Theater means the theater can now show movies from any digital source, as opposed to films available only in 15/70 mm prints. “Doctor Strange” will be shown digitally in 6k high resolution with 11,600 watts of digital sound in industry standard theater aspect ratio. Beer, wine and other concessions will be available. The Science Center’s new ticketing system now allows guests to choose their seats in advance. Tickets are $11 for adults ($9 for Science Center members), and $9 for youth ages 2-12 ($7 for youth members). Advance sale tickets are available online at GreatScience.com, at the Science Center box office, or by calling 216-621-2400. Great Lakes Science Center, home of the NASA Glenn Visitor Center, makes science, technology, engineering and math (STEM) come alive for more than 300,000 visitors a year through hundreds of hands-on exhibits, traveling exhibitions, the Cleveland Clinic DOME Theater, Steamship William G. Mather, daily science demonstrations, seasonal camps, family workshops and more. The Science Center is funded in part by the citizens of Cuyahoga County through Cuyahoga Arts and Culture. Visit GreatScience.com for more information. For urgent media inquiries on weekends and holidays, please call 216.694.2000 and ask for the manager on duty. Please note that same-day interview requests may not be possible. We are happy to accommodate photography and filming requests. Due to of the high volume of inquries, we must review each on a case-by-case basis. If you have a project you’d like considered, please email Joe Yachanin at yachaninj@glsc.org with details. Please note that same-day and same-week requests may not be possible.